As any sailor will tell you, there is no sight more beautiful than that of a vessel skimming over the waves, her sails bellying out with the wind, white and pristine. Though it looks effortless from afar, this image requires quite a bit of upkeep. Sails must be properly taken care of both on and off the water, with the key component being to pay attention to what is happening in your boat, as always. Below is a guide to maintaining your sails so you can get the most and best use out of them. Before it begins, it is important to know that sails are made of a few different materials. The most common are Dacron, Kevlar, nylon, and mylar. Most of these materials require similar care, and any differences will be noted in the guide. If your sail is made of mylar, it is particularly fragile, so take extra precautions with all the tips mentioned here. Sail technology has come a long way in the space of the past few years. Sails for general use on the same level as racing sails of past years, while racing sails are on a whole different planet. 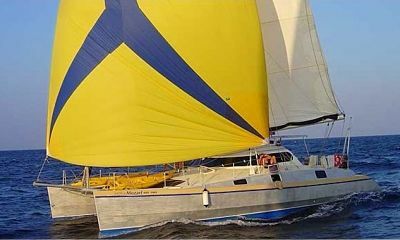 Though these sails are more advanced, their materials are increasingly firm and the finish or resin that coats it is more subject to breakdown. To avoid the resin breaking down too quickly, try to avoid luffing your sails as much as possible. For example, when pointing into the wind to hoist the mainsail, do not power the boat forward and try to keep the sail as well trimmed as possible when it is being raised. Also, try to make your tacks quick and efficient; pass through the wind as quickly as possible to avoid unnecessary luff. It is imperative to learn about your sail from the sailmaker or brand purchased. In order to get the maximum use from your sails, they must be set properly. Certain sails are made for a specific range of wind speeds, so check that information against the wind ranges in your area, and use appropriately rated sails. Chafing is another danger that faces sails when they are in use. Reduce the risk of damage from chafing by avoiding it whenever possible. Check that stays are not constantly rubbing up against the sail. It is a fact of sailing that chafing cannot always be avoided, but in these cases, you can take steps to minimize it. Some parts of the rigging will come in contact with your sails no matter what, so take notice of chafe points and either cover the point with an extra layer of tape or bring your sails to your local sailmaker and have them place layers of extra fabric on the danger zones. Another enemy of your sails is the sunlight. Unless you plan to sail only on cloudy days or at night, the sun is impossible to avoid. As it will eventually break down the cloth, you should take steps to protect your sails from sunlight whenever possible. In cruising around a harbor, you will see many boats with sails furled around the boom, secured only by sail ties. This is a huge mistake! As soon as your sail is furled and tied, cover it with a sail cover. This will protect the sail on the unfortunate days when you cannot make it down to the water. When taking your sails down for the winter, do not just store them in sail bags and toss them below deck. When you take them off the mast, inspect their entire length for any cracks, tears, or signs of chafing. If there is any damage to your sails, see the section on repair below. Before you store your sails for the winter, wash them down with warm water to remove all traces of salt. Salt is extremely corrosive — if left on your sails it can erode the material. Sails can pick up other stains as well. If there is rust on the sail, keep the area wet and soak with lemon juice for about an hour. Sometimes through accidents, sails may be stained with blood. If this is the case, wash with soap and cold water. Lemon juice will take care of mildew, and detergent is suitable for mud or grass. Once the sails are washed, leave them spread so that they can dry completely so that mildew will not develop during the winter months or any other periods of disuse. When folding your sails for storage, work with someone to stretch the sail out so that the sail will have as few wrinkles in it as possible. 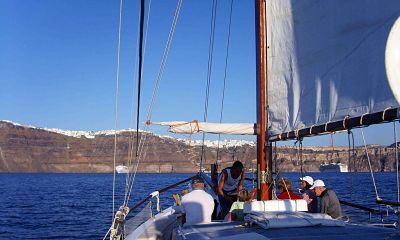 Creases damage the resin and decrease the longevity of the sail. Once the sail is folded and stored in its bag, keep it in a dry space until it has to be taken out for further use. Though serious repairs should be seen to be a professional, it is possible to patch up tears or other damage on your own. Spinnakers are most often made out of nylon, as it is both lightweight and strong, but it can tear very easily. Adhesive sail repair material, or sail tape, can be used to patch up small tears, although this is only a temporary fix. When patching a sail, make sure to cut a patch larger than seems necessary, as sewing a patch too near the edge of the tear will only damage it further. Tell-tales, the strips of yarn or fabric that guide you in trimming the sails, often wear quickly as they are made of light material so that the wind will catch them up with ease. Replacements can be found at marine supply stores and installed with ease. Sails can last for years if you take proper care of them. Like many aspects of boat repair and maintenance, sail upkeep requires careful attention to the details of your boating experiences.